This is an interesting pendant I made last summer after I was scrounging around in a stash of buttons. It is plastic and probably made in the 1950s it is light pink and has sparkly strands of what looks similar to "Easter grass" embedded within it. 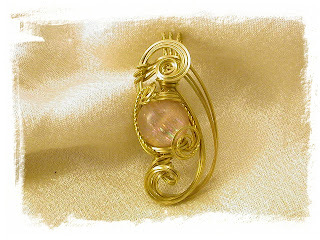 I used jewelry grade brass wire and made a Preston Ruethor style pendant setting for it.. what has been strange is the brass has not seemed to tarnish at all... this type of setting is hard to really see in a picture as it is very three dimensional and a flat picture can't convey the depth and structural quality of the piece. I wrapped another button that turned out so strange if viewed I swear would scare the bloomers off yer Granny!